MALACCA: The Government will give financial aid to the flood evacuees to ease their burden, Datuk Seri Najib Tun Razak said. The Deputy Prime Minister said the aid would take into account damage to their homes and appliances and other considerations. “The assessment will be conducted after the floods but this aid is not a form of compensation,” he told reporters after visiting SM Kebangsaan Munshi Abdullah in Batu Berendam here, which has been turned into a flood relief centre. 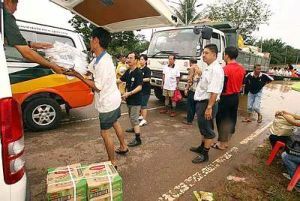 CHAIN OF HELP: Volunteers helping to distribute aid to flood victims in Muar yesterday. Najib, also National Disaster Management and Relief Committee chairman, said so far, assistance had been given in the form of food and equipment when victims were evacuated to relief centres. “There is no food supply problem in most of the centres. In fact, at some centres, there is not only sufficient but also a wide variety of food for the flood victims,” he said. Meanwhile, Women, Family and Community Development Minister Datuk Seri Shahrizat Abdul Jalil said the National Welfare Foundation would be donating RM2.1mil to flood victims. Shahrizat, who is the foundation's chairman, said each family which registered with a relief centre would be given RM200. “We hope to disperse the money to the families over the weekend. There is a massive mobilisation by the department, as we are looking after 91,541 victims nationwide,” she said. Another RM3.1mil worth of supplies had been sent by the Welfare Department, she said. She added that 500 department officers from unaffected states had been brought in and they are on 24-hour standby. In Kota Tinggi, the body of a Nepalese was found caught in a tree in Jalan Abdul Aziz yesterday, bringing the number of deaths related to the floods in the state to eight. Chandra Bahador Karki, 24, an electronic factory worker, drowned when he went for a swim in the floodwaters with some friends on Friday morning. While the flood situation in some districts in Johor had improved, the number of evacuees went up to 66,646 by yesterday evening, with a total of 295 relief centres opened. As at 8pm, Muar district had the highest number at 18,957. Floodwater continued to hit several new areas in the district, especially near Kesang, Parit Bunga, Rawang, Sungai Balang, Sri Menanti and Air Hitam. In Segamat, water had receded and continuous efforts were being made to reach Felda settlers and also other victims still stranded in their homes. All roads leading to the district are still not passable to light vehicles. The situation was also improving in Kluang and Kota Tinggi. Over in Negri Sembilan, the situation is reported to be improving in Gemas while in Tampin, all the main roads in the district have been opened to traffic. In Malacca, as at 4pm yesterday, there were a total of 12,504 evacuees from 2,504 families in 38 centres. In Pahang, people in Kuantan returned home in batches as water levels in several rivers dropped with practically no rain in the past two days. The number of evacuees went down to 2,748 at about 3pm from 2,980 in the morning. In Rompin, however, the number of flood victims rose slightly to 1,902, with evacuation still being carried out in Kampung Gading and Kampung Badak in Bandar Tun Razak. In Terengganu, the number of evacuees in relief centres rose to 249 people. A spokesman at the state police flood operations room said the latest evacuees, comprising 79 people, were from Kampung Geliga, Kemaman, hit by tidal waters on Friday night. Waves of some 2.5m also hit Kampung Pengkalan Atap and Kampung Pantai in Kuala Besut early yesterday. According to the state Drainage and Irrigation Department, more strong waves, as high as 3m, could hit the coast late tonight. In Kelantan, the situation is returning to normal and the water levels of major rivers have been subsiding. All the main roads in Gua Musang, Jeli and Pasir Puteh were opened to all vehicles. The Meteorological Department said yesterday that the threat of heavy rains over the Klang Valley was now slim because of improving weather. It said the situation in Johor, Malacca, Negri Sembilan, Kelantan, Terengganu and Pahang was expected to improve but rain would persist until today while in eastern Johor, rains were expected to continue until Wednesday.